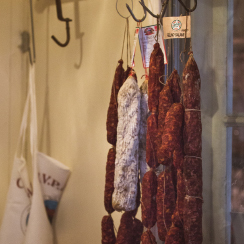 Perhaps you got swept up in the excitement over handcrafted, traditional cured Italian meats and brought one home, but you’re asking yourself “now what?”. Salami is best eaten as soon as it is cut and you should remove only enough skin to access the quantity of salami you require. 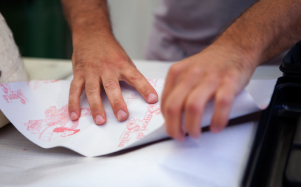 Once cut, the salami should be wrapped with a Tea Towel around the cut surface and placed in the fridge. 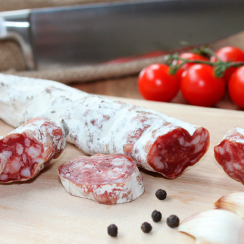 You may notice that the cut end of the salami discolours – this is due to slight oxidation. The salt may also have started to crystallise on the end surface, which may alter the taste slightly, but it will just be the end piece that is affected and the remainder of the salami will be fine. To remove the peel, cut off the tip, score the salami lengthwise along as much of the salami you plan to eat, and then peel off that portion & peel slowly as it may be slightly brittle and dry. Like with all meats, a sharp knife makes for a much more even and tastier slice. letting the Salami get to room temperature out of the fridge both makes it easier to cut and brings the salami to its peak flavour. 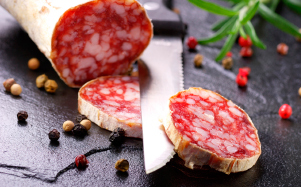 There are many ways to slice your favourite Salami all depending on whether you like it sliced thick or sliced thin either way using a sharp knife brings out the best attributes to any Salami. 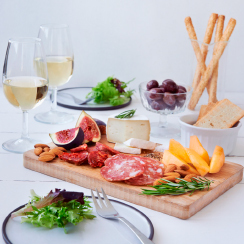 You can serve Salami in many different applications from placing on a Antipasto platter or adding it to your panino or favourite pizza topping alternatively all of our Salumi can be eaten on their own. 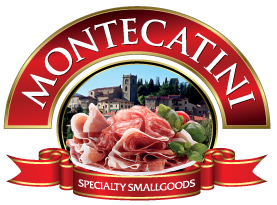 EVERYTHING YOU SHOULD KNOW TO ENJOY YOUR MONTECATINI SALAMI. 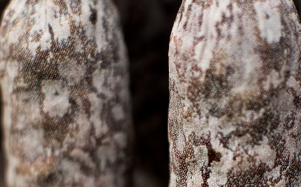 Mold is a safe and vital part of the artisan process, creating flavor and protecting salami from bad bacteria. Once the salami is released from our curing cells and vacuum sealed, the fluffy white mold can transform into a variety of colors that you sometimes see on the surface. WHY IS THE SALAMI CASING STICKY? If your salami has a case of sticky casing, not to worry. Nothing is rotten or has gone bad. The salami has simply been in its sealed packaging and sometimes can absorb moisture creating a tacky or sticky sensation. Sometimes there’s an ammonia smell, too, which is natural. To remove both, simply peel the salami and let it sit out on the counter for 5-10 minutes and enjoy. 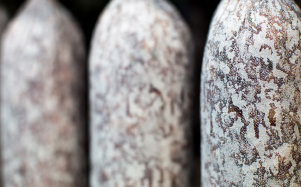 Keep the salami cool in the refrigerator until ready to eat or take to a party, picnic, etc. Once opened and cut, wrap any leftover salami in a dry tea towel or a resealable plastic pouch and store in the refrigerator. DO I EAT THE PEEL? For the best taste experience, we recommend peeling. Even though we use natural casings which are edible, it’s better to serve it without the casing to get the full flavor of the salami.